We're finally sitting down tonight in the Children's House almost ready for bed. (Thankfully, they were able to fit us in. Yay!) The past two days have been tiring, to say the least and I am looking forward to a great nights sleep. Hopefully. I'm sure some of you are wondering what exactly is going on, how Rambo is doing, and why he was flown out. I will try to answer all of that in a not too lengthy post. As you know, he was struggling over the weekend with a high fever that wasn't coming down with medicines and was making him overall miserable. I took him to the doctors on Monday because he just wasn't getting over it and starting to have more critical issues in my eyes. I told the doctor when we got there that I wasn't sure the hospital could be avoided this time. One of my biggest concerns was dehydration because Theodore had been struggling with that, but he assured me he was not dehydrated. He thought it was probably the same virus the other two kids had and would be over it shortly. 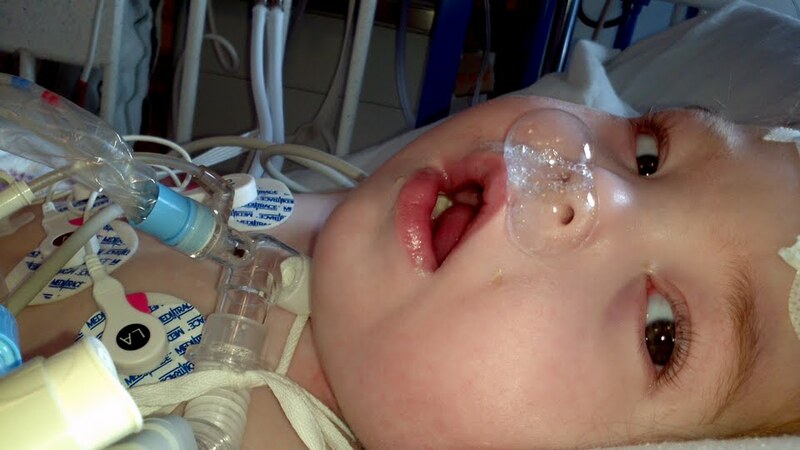 Control his temperature and give him lots of fluid and go home. I wasn't completely satisfied with that answer but was glad that I had gotten an objective perspective. Later that day Theodore's fever spiked to above 104. It had yet to be that high and it didn't make me happy. A call to Hopkins, our local hospital, and the doctor again and we are still at home 'managing' it. I will pause now to say that I do not necessarily think that any of the above people I mentioned did anything wrong. They were all doing what they thought best, but I still could not shake this urging I had that something wasn't right. Thankfully, Theodore fell asleep that evening and slept comfortably through the night. But the next day held the same things as the day before as well as new difficulties. He started desating. His oxygen levels that should be at least a 94 dropped suddenly to 77. When he was awake he was sitting in the low 80's. 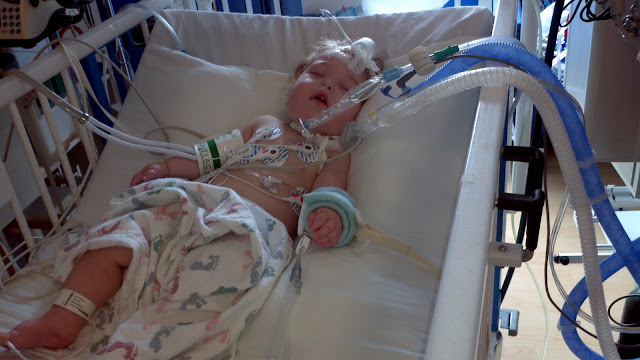 His temperature would not come down unless he was in a bath (which he got for at least 40 minutes 3 times a day at this point). That really was the last straw for me. I had utterly lost it. I had no more control of my exhaustion and the feeling that was killing me inside that I was not happy with what I was being told. My mother in law texted me at just the right time and I immediately called her back and burst into tears telling her that I didn't know what to do. Of course she came out to my house almost immediately to help me assess him. As soon as she got there she calmly said "Let's go." Rambo was pale. He was gasping. He did not look good. We got to the hospital as quickly as possible. For any of you, and I'm sure there are a few, who have had troubles with our local hospital which will remain unnamed, I give them tons of credit. They asked how long he had looked like he did and rushed him back. As soon as he got in a room he was surrounded by doctors. Literally there was not an inch at his bedside to be spared. Theodore was having some kind of episode and EVERYONE was concerned. Most of you know what we have been through with Rambo, and I can honestly say that in light of all of that, this was scarey to me. 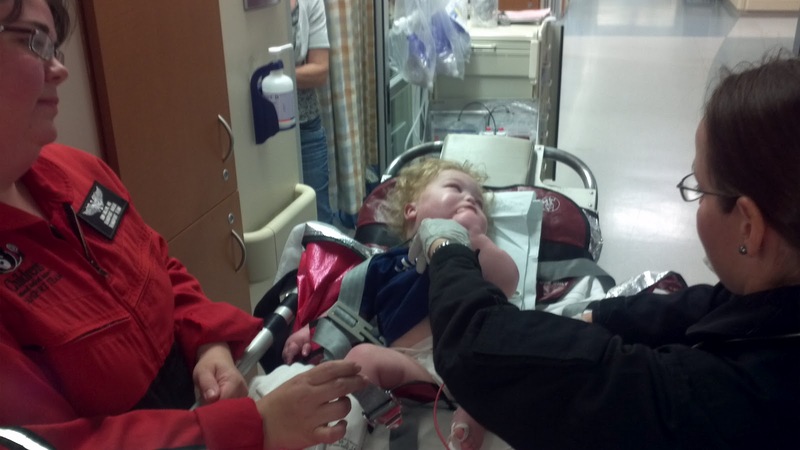 It took about 2 hours of them working on, fussing with, and caring for him until he started looking better. There are many details that I won't go into. I just don't have the energy. But I'm sure you can imagine the number of tries to get an IV, the talk of what was happening, having his pediatrician look at him again.... It was crazy. And a part of me wishes that could have been avoided. Alas, that was not the way it was meant to be. We found out they were flying him out and I am so thankful they did. 10 minutes into the flight he had another episode where his oxygen dropped into the 40's and they had to bag him the rest of the way. 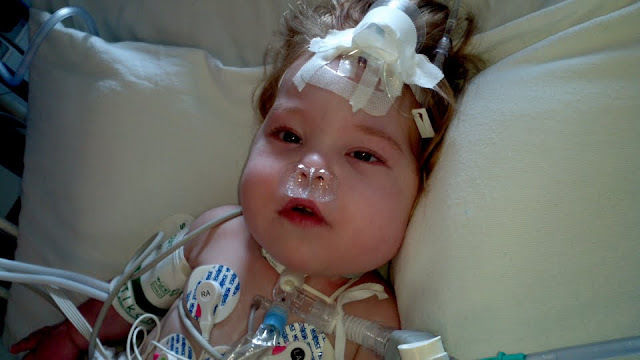 When they got to Hopkins he was immediately admitted to the PICU and put on the ventilator. Where he remains. Now for the update: Not much has changed. Theodore has been sleeping. He also had a bunch of stuff in his lungs. That is all finally coming out. ...out of his nose. Gross. But also impressive. These were two rare moments when he was awake today. We left him asleep and comfortable tonight. I honestly hope he dozes most of tomorrow too and lets his body recoup. Aslo when he's awake, he's still really really agitated. I'll update again soon. Goodnight. Amanda you know I am praying for you and Theodore and of course the family. I know I do not have to tell you how much of a very very strong woman you are b/c you already know this, but sometimes it is still nice to hear that phrase and read those words. Many people would have giving up, and you have never done that. You are the most kind caring loving person that I know those far and I commend you for everything you do and continue to do so. But I do also have to say in those two rare moments of pictures with his eyes open, he shows everything that you hold in your heart and you show to others..... a kind caring loving child that is not ready to give up and will continue to fight!! I love reading your stories, though they are sad, frustrating at times, but heartfelt in every way. Stay strong and keep pushing through as I know you and Theodore will!! Love you all and all the many prayers coming your way!! I can't help but imagining when I read these posts, "what if this was my son?" It just breaks my heart now that I'm a mother. I went to sleep last night thinking about him. Praying that God will be your strength and his strength today. Oh Amanda and Ben, I am literally weeping. 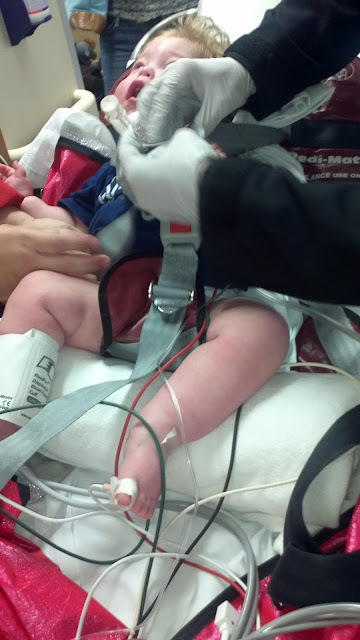 He is such a little fighter and it breaks my heart. You are both incredible. I fall to pieces when one of my animals ( children ) is sick. I can not even comprehend what you all must be going through. Constant thoughts and prayers are with you. Warmly as always, Sarah P.S. Christopher too.